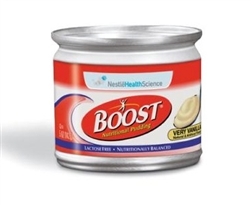 Boost® Nutritional Pudding provides 240 calories, 7 grams of protein, and 24 vitamins and minerals in each 5 ounce cup. This creamy pudding is available in vanilla or chocolate flavors and is great for diets that restrict fluids, pureed diets and help meet increased calories or protein requirements. This nutritionally balanced snack will add familiarity and texture variety to any diet. 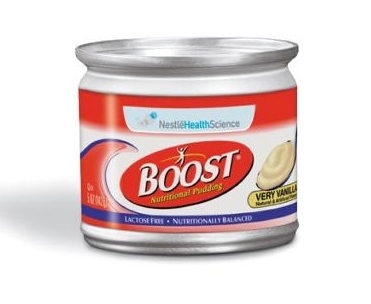 Boost® Pudding is appropriate for: lactose-free*, gluten-free, low-residue and kosher. Boost® Pudding provides nutritional support for protein-calorie malnutrition, fluid restriction and dysphagia. Detailed nutritional information can be found on the Nutritional Information tab of this product page and the ingredients are on the Ingredients tab. Water, Sugar, Maltodextrin, Milk Protein Concentrate, Canola Oil, Modified Corn Starch, High Oleic Sunflower Oil and less than 2% Corn Oil, Calcium Caseinate, Sodium Caseinate, Potassium Citrate, Magnesium Phosphate, Calcium Phosphate, Salt, Sodium Stearoyl Lactylate, Potassium Chloride, Sodium Ascorbate, Natural and Artificial Flavor, Choline Chloride, Carrageenan, Alpha-Tocopheryl Acetate, Ascorbic Acid, Ferric Pyrophosphate, Zinc Sulfate, Ferrous Sulfate, Niacinamide, Calcium Pantothenate, Manganese Sulfate, Copper Sulfate, Pyridoxine Hydrochloride, Thiamine Hydrochloride, Riboflavin, Beta Carotene, Vitamin A Palmitate, Folic Acid, Chromium Chloride, Vitamin D3, Biotin, Sodium Molybdate, Potassium Iodide, Sodium Selenite, Phytonadione, Vitamin B12.